The countdown has started, only 12 days left. 12 days left to what you ask? 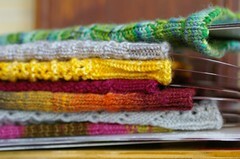 Yup, yarn4socks will be at Stitches East this year, which means that we’ve been crazy busy getting everything ready for it. There it is! I don’t know why I thought that a Pomatomus would be a good deadline knitting sock but it ended up being better than I anticipated. 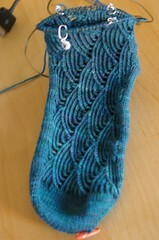 I’ve only 2 repeats to go on the leg and then I’ll be all set for the ribbing. So it should be finished in time. 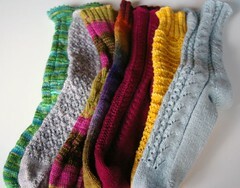 You can’t really tell but there are at least 16 sock blockers there. The remainder are still in need of a bit of finishing. 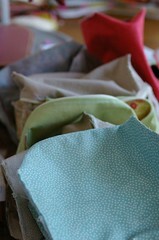 You can see them there assembly line style (my sewing machine is right off picture). I still have a couple things to do to them before they’re completely finished but they should be done in time too. Guess what I’m going to be doing this weekend! All silliness aside, if you’re in the Baltimore area and are planning to go to Stitches East, please come and say hi! You are rockin’ it Val! You’re doin’ a great job! Good luck it sounds like alot of work. Love the bags! 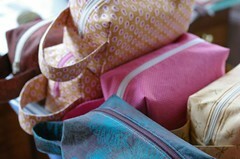 All those gorgeous bags are going to be a big hit! I so wish I lived closer and could go.